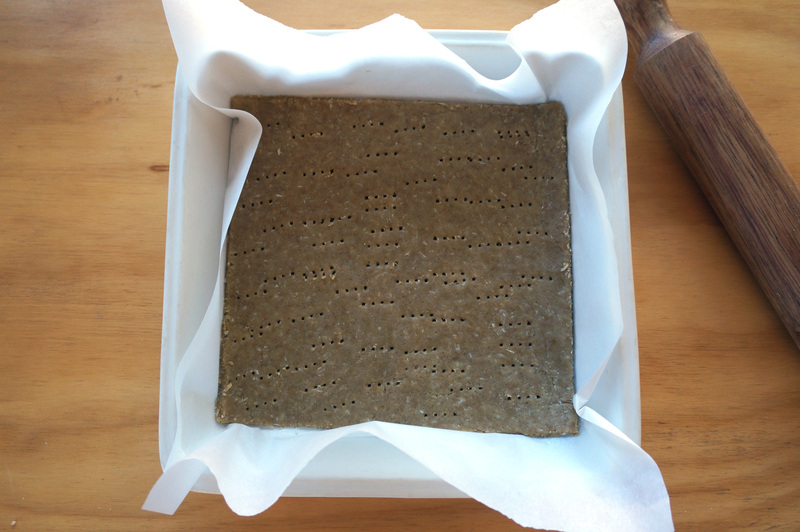 The base which is a simple gluten-free pastry that is rolled out and baked in the oven. Melted carob chocolate which is brushed over the base to seal it, and keep it crisp so the filling doesn’t soak into it after the first day. 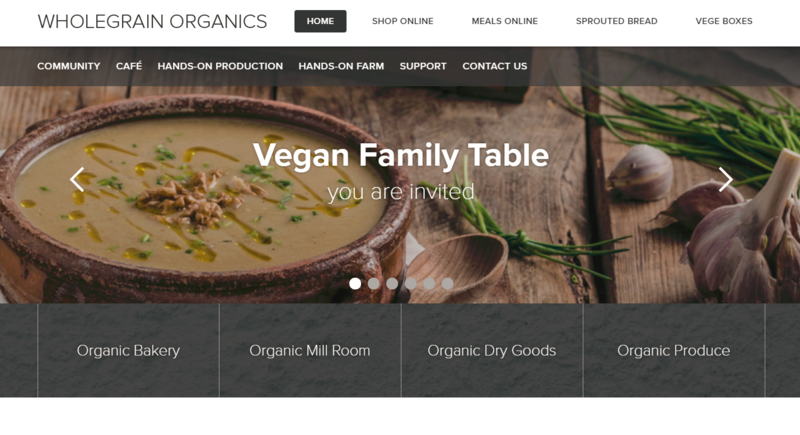 Alternatively, if you live in the Manawatu (NZ) you also have the option of purchasing the finished product from Wholegrain Organics. If you have a thermomix or other blender that heats at the same time this is definitely the time to use it! This cake is also fun to make with kids, they enjoy the rolling, the brushing with chocolate (believe me, they love that part! ), and the layering. 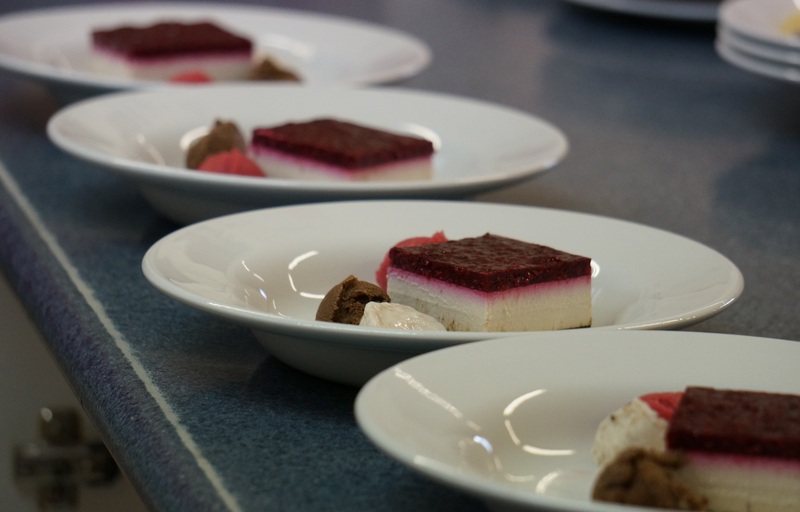 They also love making slightly too much jelly and setting the extra in glasses over fresh fruit for a yummy snack. Delving into a bit of maths, the quantities are important so the layers are the right thickness. I have based all the measurements on using a 22-24cm square tin. Of course it doesn’t have to be square, but anything that gives the equivalent area of around 500cm² (in the range of 480cm² – 550cm² will work fine). So just multiply your length x width to get the area. E.g. 20 x 26 = 520cm². If your dish is a bit smaller just make an extra little one on the side in a ramekin dish, it won’t go astray! It is also preferable to have a dish with straight sides. It doesn’t have to be deep though, a 5cm deep cake tin or pie dish is fine. Metal or ceramic is fine. Both of these dishes worked well for this recipe. 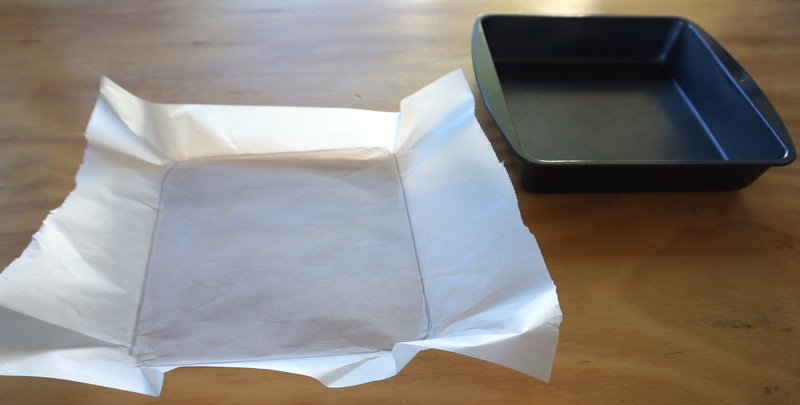 The next step is to line your dish with a large enough piece of baking paper so it goes up the sides and gives you enough to grab for removing the finished cake. Now draw around your dish base with a pencil, as in the photo, so you know how big to roll your base. Turn your paper over so you don’t eat pencil! 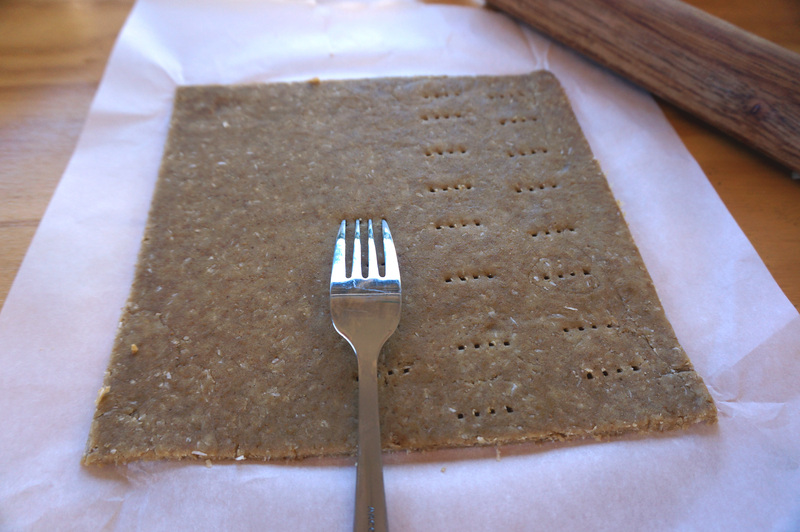 Draw around the base of the tin with a pencil so you know how big to roll your pastry. NOTE: By far the easiest way to tackle this recipe is with a good digital scale. However, if you don’t have such an item, I have given the most accurate equivalent measurements I can. All measurements are level, and metric. 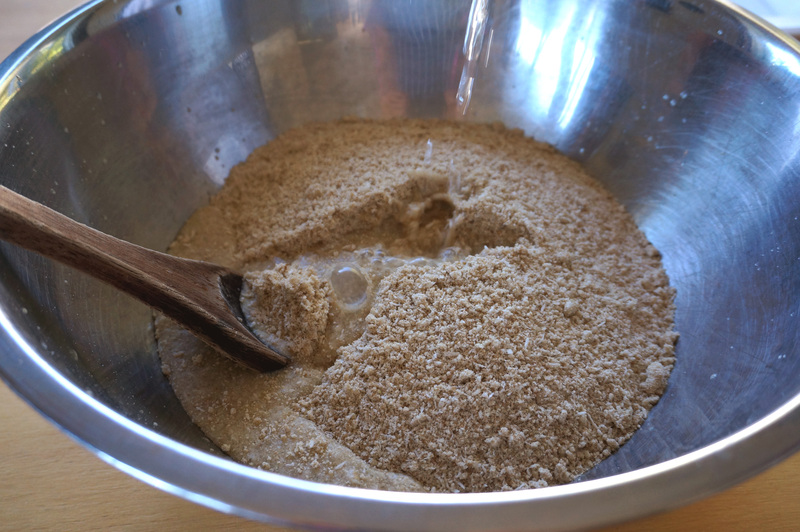 Add flours, coconut , rapadura and salt to mixing bowl, mix together briefly. Add palm kernel oil (or coconut oil) and rub in with fingers until evenly distributed, resembling fine bread crumbs. Add water, and mix to form a ball. 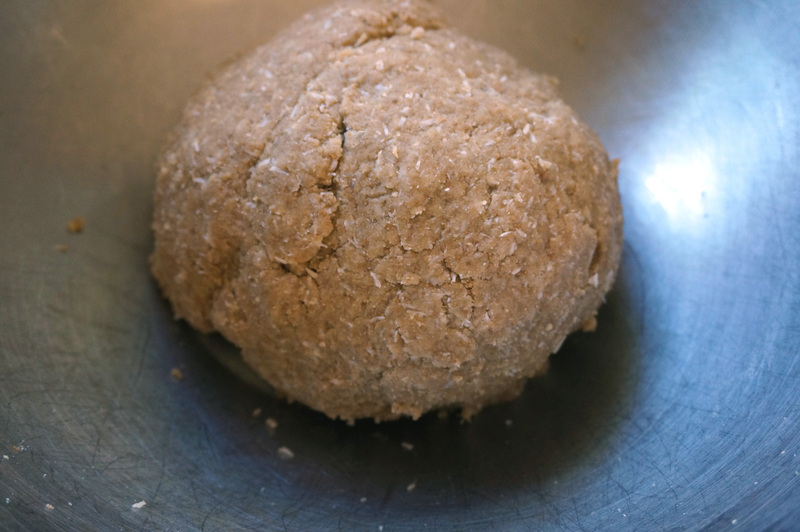 Be prepared to add another half tablespoon of water if your dough doesn’t come together. Take your already pencil-marked sheet of baking paper, and turning it upside down place your ball of dough in the middle of it. 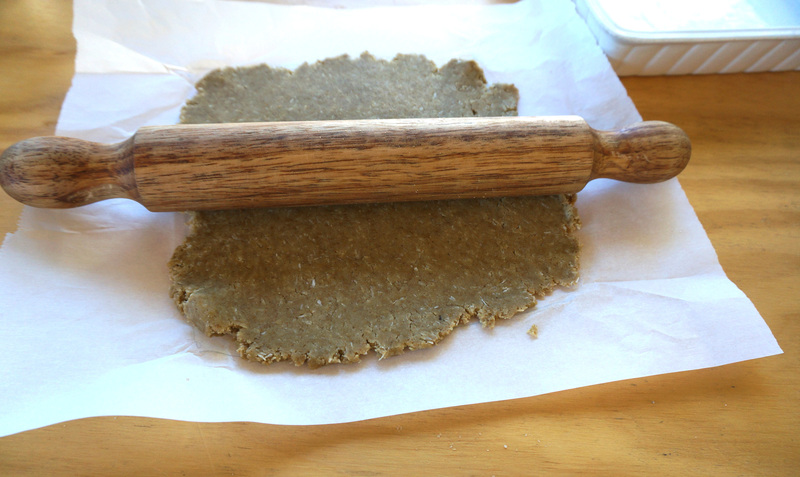 Flatten with your hand to get started, then roll all the dough out onto the baking paper exactly fitting your marking. Sprinkle extra rice flour or buckwheat flour over dough to prevent it sticking to the rolling pin. When rolling, you will of course go over the edges (of your pencil line), that’s okay, then just fold the paper back on itself at the line, giving you a good neat edge of dough, and roll it out gently, towards the centre of the dough. Prick your finished dough with a fork – this lets the steam escape and helps minimise shrinkage and cracking. 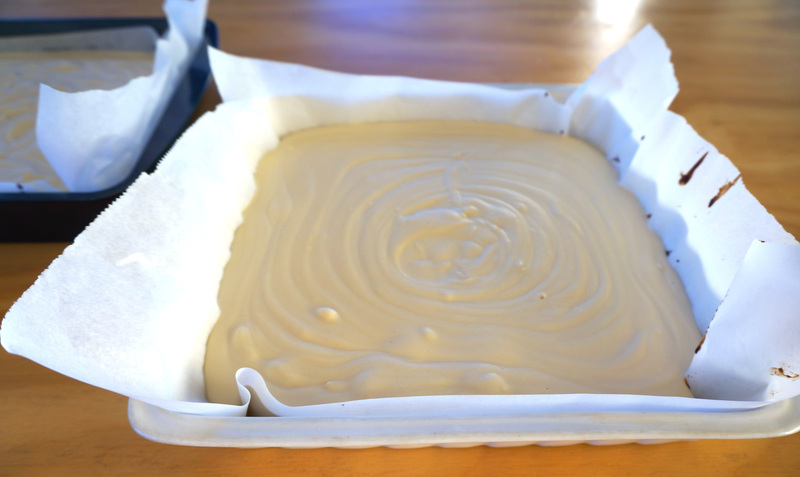 Transfer the baking paper (with rolled out dough on top) into your tray. 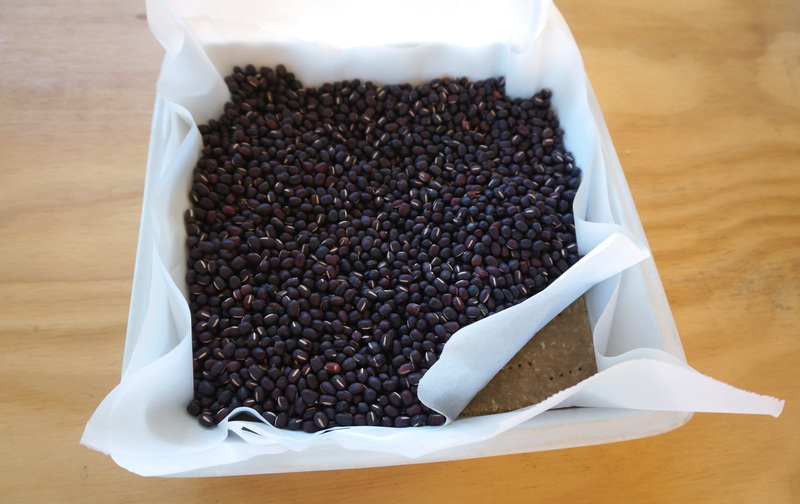 Place another sheet of baking paper on top, then add a good layer of beans (large ones like berlotti beans) to bake blind. Remove the beans and top layer of paper, return to the oven and bake for another 10-15 mins until it is going golden and cracking. Don’t burn, but bake until crunchy and delicious. Cool quickly (fridge/freezer works well). While it is cooling melt the broken/chopped carob chocolate in a metal bowl over a slightly larger bowl of freshly boiled water. 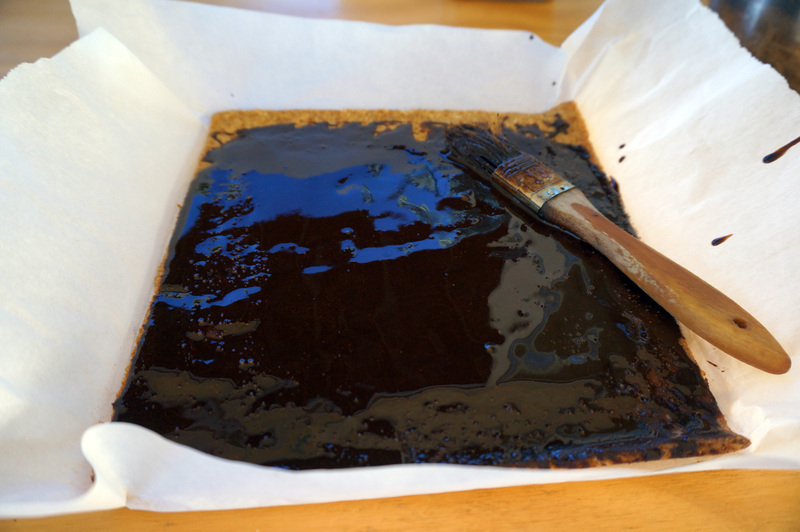 Once the base is cool brush the chocolate over, coating the base completely, using a clean pastry brush.Chill the base until the chocolate is set. Alternatively, you can just pour the melted carob chocolate onto the cool pastry and spread around with the back of a dessert spoon, it is easy to spread. Your base is now complete! Let the chocolate cool and set for a few minutes. This is where you get to use your thermomix or other heating/blending device if you have one! If not don’t despair, but be prepared to stir stir stir while it cooks for a few minutes. Place all the ingredients into a good blender. 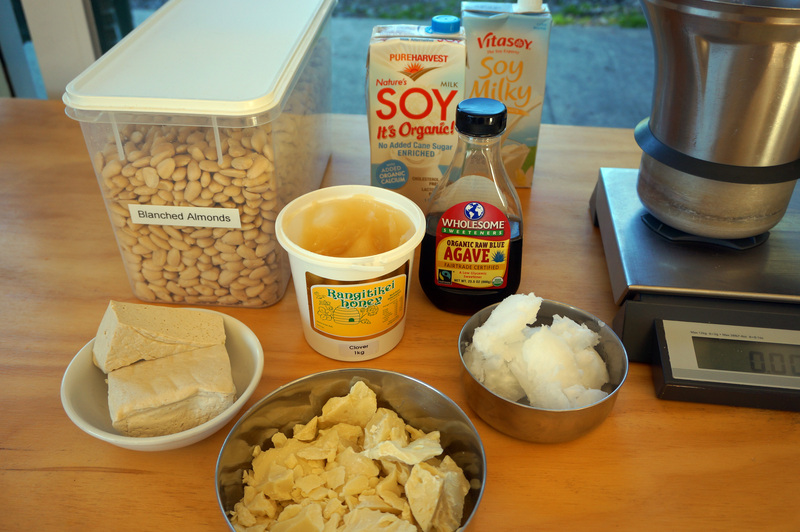 Blend for at least 5-10 minutes until it is really smooth and creamy and the nuts are not bitty at all. If your blender also heats, then set it to cook/blend for 8-9 mins, @ 90°C, high blending speed (thermomix speed 7). If you have a normal blender, you will now need to transfer the smooth creamy filling to a saucepan, and stir constantly over a medium heat until it is thickened and bubbling. To make sure it is completely creamy and silky smooth, you then want to transfer back to your blender and blend a couple of minutes until perfectly smooth. Caution: blending hot liquids is dangerous, leave the centre piece off and hold a folded teatowel over the top to avoid hot splashes. Pour your filling over your completed base. 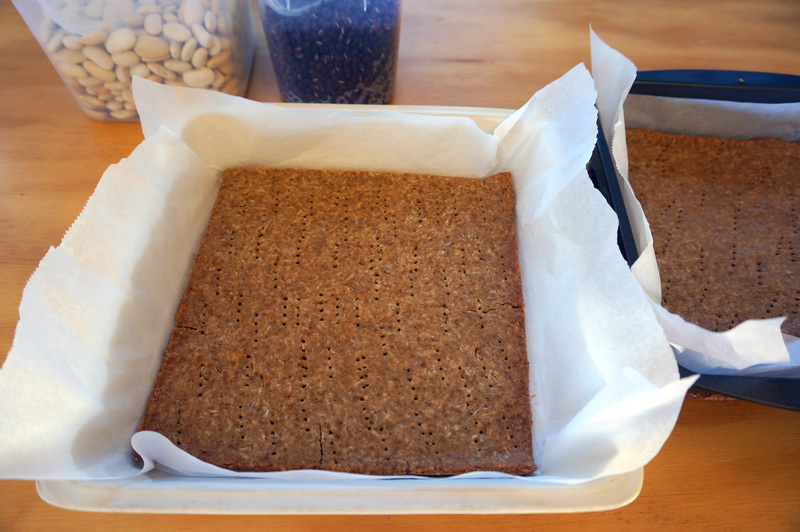 Tap a few times to make sure it is fairly evenly distributed and into the corners. Place water/juice in a medium saucepan, add berries and place over a medium/high heat. Sprinkle over the agar agar and add the honey. Let the warmth melt the berries a bit and stir to combine. Once it comes to the boil, stir and allow to boil for 2-3 minutes. 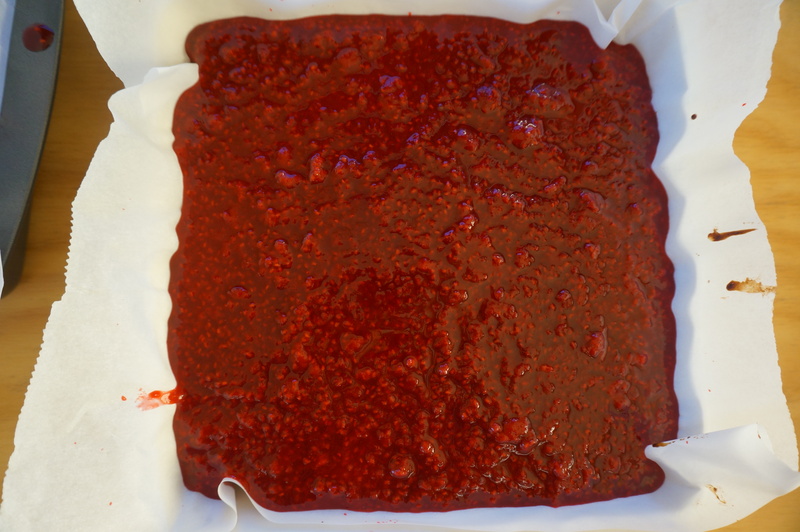 Remove from the heat and gently spoon over your cake filling. Spread gently with the back of a spoon. Let it cool before moving (around 15 minutes if filling was already cool). 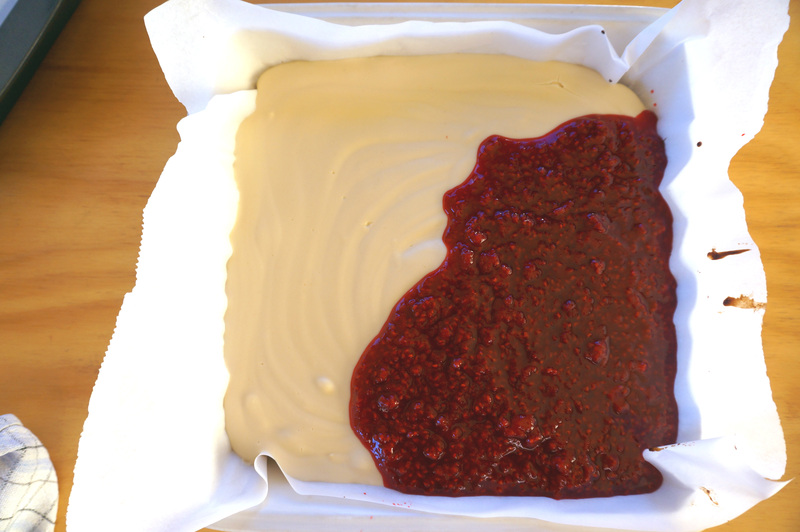 Refrigerate finished cake to allow it to set fully. 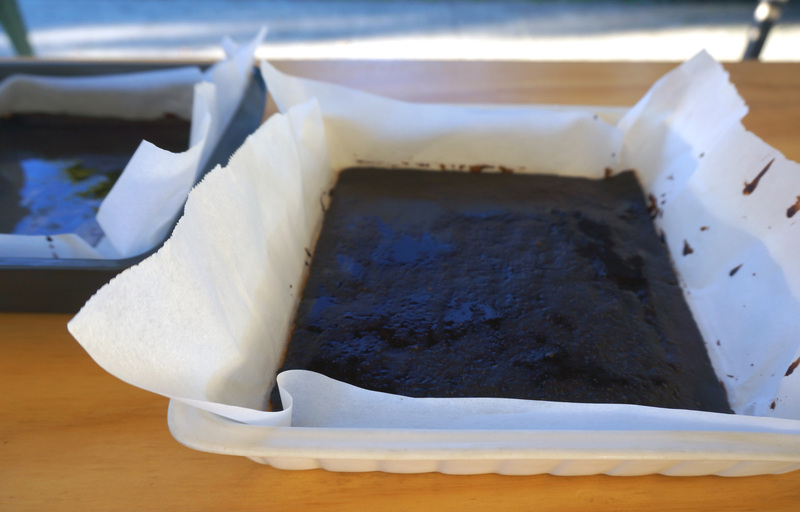 Once your cake is completely cold remove it from the pan by lifting it out with the baking paper and place it on a large enough chopping board. Using a heavy knife cut your cake into 9 equal portions, the base will be quite crunchy so you will need to use a bit of downward pressure to get through it. 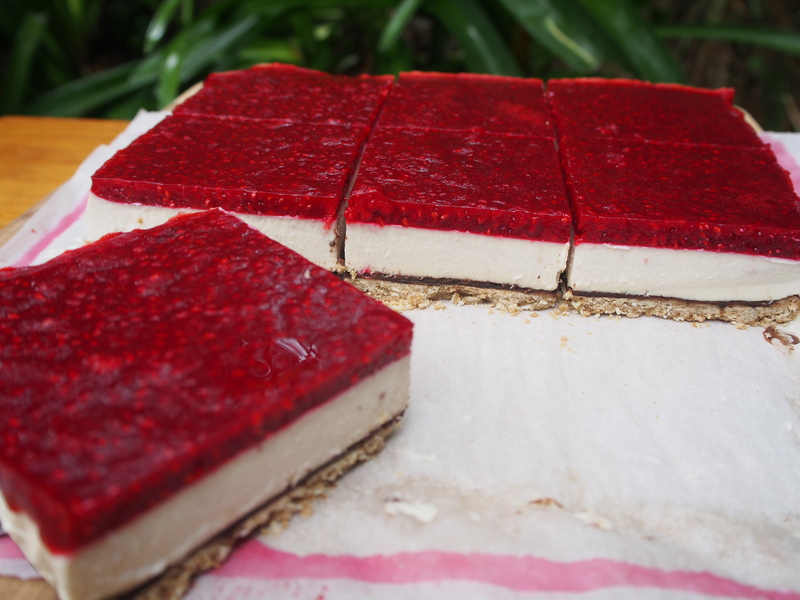 The crunch is delicious on the palette as it gives a contrasting texture to the creamy filling. This cake is absolutely delicious!! Thanks for sharing. I definitely will try to make it!